I have collected together the notes I made while trawling the various vegetable websites and gardening blogs or while reading the many books on the subject of growing potatoes. I don’t claim to have any great experience as a potato grower but I thought that this would be an easier way for me to reference the information and it might help others as well. Any comments or advice would be gratefully received! This refers to giving your seed potatoes a head start on the growing process before you plant them out. This should also make sure a better harvest as a result particularly with the early varieties. It should be possible to start chitting somewhere around the end of January or early February with the idea of planting out roughly 6 weeks or so later. It is a good idea to order your seed potatoes in good time from a reputable source to make sure you get a decent choice of tubers. First look at the seed potato to find which end has the “eyes” where the new shoots will start to form. You should reject any tubers that have any sign of disease or rot as you don’t want that getting into your soil. Place the tuber with this end upwards in something like an old egg box but ensure they have plenty of natural light. These should be placed in a cool (but frost-free) spot with plenty of light – somewhere around 10C is recommended. 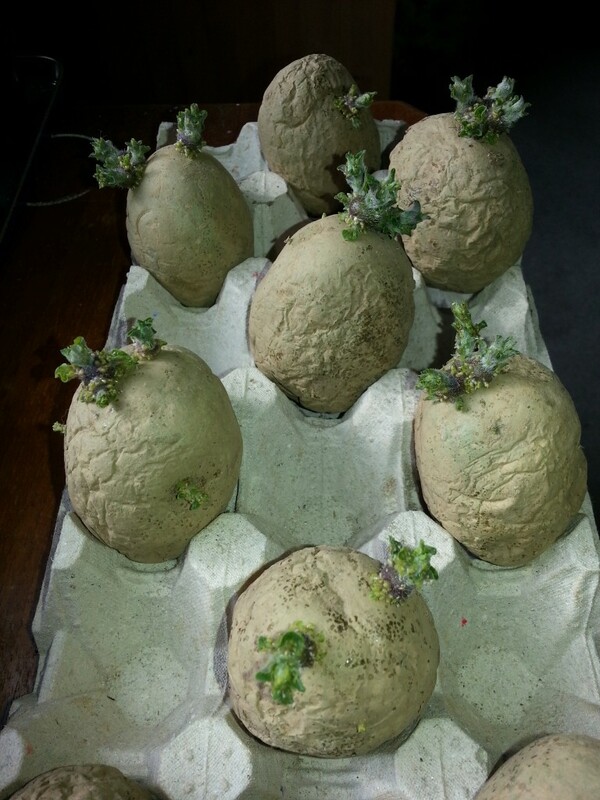 If your chitting has been successful you should end up with a few dark coloured shoots from each tuber. Many books suggest that you keep just 3 or 4 of these shoots and rub off the rest before planting out. This reduces competition for resources by the remaining shoots otherwise you may end up with lots of very small potatoes. 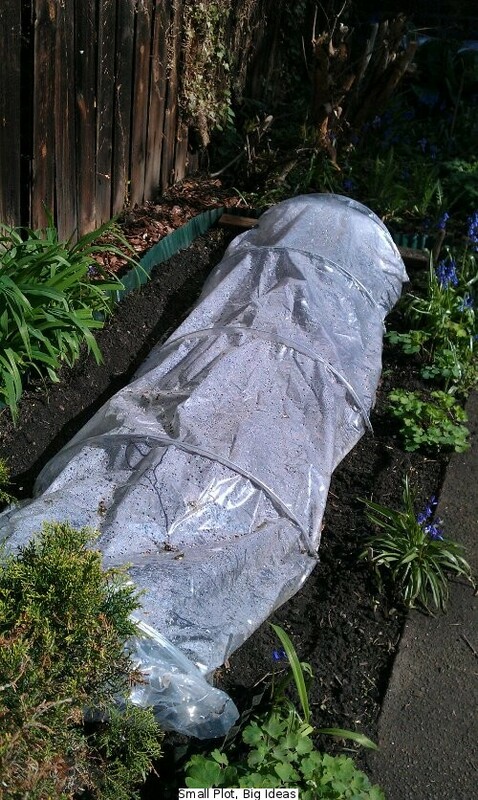 By planting time the soil should have started to warm up, if necessary use a cloche or similar cover to protect the soil for a few weeks beforehand. Once the shoots are around 2.5cm long they should be ready to plant out assuming the weather has warmed up enough. If not then leaving the tubers where they are for a few days or so more shouldn’t cause any major problems. Early varieties are planted so the plants are 30cm apart in rows that are about 45cm apart. Other varieties are planted at up to 40cm intervals in rows that are 75cm apart. Dig a trench that is roughly 8cm – 12cm deep (depending on the size of your tubers) and plant with the shoots uppermost while avoiding any damage to the shoots. Cover lightly with soil so just the tops of the shoots are visible (and don’t water them). Aside from keeping an eye on the weeds and pests, the main task is to earth up the plants as they develop by drawing more earth around the base of the plant. This is necessary because the potatoes must be kept away from the light to avoid them going green. It also encourages the plant to form more roots and thus you hopefully get more potatoes. Use a rake to bring the soil from between the rows into a flat-topped ridge around the base of the plants. This should be done regularly during the growing period and by leaving the top flat you limit the water run-off. Maincrop potatoes take longer to develop (with an increased risk of blight) and these can be harvested once the foliage starts to go down, ideally cut down the foliage a few days before harvesting. Pick a sunny day with no risk of rain and use a fork to dig up the plants from the side to avoid disrupting the other plants in the row but you can expect to spear a couple (it happens to everyone!). After getting rid of any large amounts of soil, leave the potatoes on top of the soil for a few hours to harden them up for storage. The most important things when storing seems to be keeping the potatoes cool, dry and out of the light. My websites recommend the use of burlap, hessian or paper sacks but boxes can also be used. Be aware that plastic sacks (even plastic lined paper sacks) will lead to condensation and this means rotting potatoes. The early varieties have a short dormant period and tend to sprout earlier so they don’t keep too well but the main crop varieties should keep for several months if properly stored.